YouTube Movie Maker Platinum offers 3 main functions; Easy to make wonderful 2D/3D Video from various formats of videos, photos, musics, lyrics, texts, etc. Easy to Make and Upload videos onto YouTube in batches without worrying about format, profile, etc. Easy to manage and promote uploaded Youtube videos, get more views on YouTube. • Make YouTube video from any popular media files, include any formats video/movie files, audio/music files, photo/picture files. • Provide hundreds of special video/audio effects and transition effects, make your movies more polished with special effects and professional-looking transitions between scenes. • Capture/Record videos from screen, capture card, cameras, etc. high efficiency and lossless quality. • Capture/Record audio from any selected audio device, selected audio input pin, etc. for example, online streaming audio, radio, audio players, game playing audio, Line In, Microphone, Stereo Mix, Mono Mix, Aux, Video, CD Audio, Phone Line, etc. • Add motion effect to the videos, pictures, texts, lyrics, subtitles, easy to make cool animation movies for Youtube. • Add cool mask effects(light and shadow effects) to the videos, pictures, texts, etc. • Make Multiple video clips or images as a Group, then add 3D Group Effects into this group for making cool 3D videos. • Customize the video and audio playback speed, easy to make fast motion and slow motion effect. • Add texts, lyrics, titles and subtitles. • Add musics and dubbing. • Built-in powerful video editor, with it you can easy to edit any formats video files, such as cut, trim, mix, crop, resize, split, merge, zoom in/out, add action/motion, take snapshots, green screening video(remove key color from the video), etc. • Built-in powerful lyric video editor, with it you can easy to make the best 2D/3D lyrics videos with the different fonts, texts, pictures, songs, colors, special effects, backgrounds, borders, layout and words position, etc. • Built-in powerful karaoke video editor, with it you can easy to make the best 2D/3D karaoke videos with the different fonts, texts, pictures, songs, colors, special effects, backgrounds, borders, layout and words position, etc. • Timeline Edit Mode allows you to arrange videos and pictures using a timeline, this will help you to add action, effects, titles and background music at just the right moment easy. • Without any special setting, you can so easy to make cool Youtube Videos via our friendly software interface with just few step. • Predefined all profiles which youtube supported, you can easy to get the best youtube videos, include HD Youtube Videos. • Batch Upload lots of videos onto youtube with right profile. • Batch Convert lots of various formats videos to right profile then upload onto youtube. • Manage and Promote the uploaded Youtube videos. • Once work finished, can auto turn off the computer. • Support CPU multi-core technology to optimize performance. • Hardware Acceleration, supports Intel® processors with Quick Sync Video capabilities, 17X faster speed video converting/encoding. • 32bit and 64bit Windows Optimize. Use any photos and video clips to make cool 2D or 3D YouTube movies, share with millions of youtube viewers, maybe you will be a next famous star. Make your movies more polished with great special effects, light and shadow effects, and professional-looking transition effects between scenes. What are you doing in the movie? personalize the movie with your own logo, maintain your copyright. easy to add texts, credits, and logo to your movies to let the world knows. Mix multiple videos on the same screen(PIP effect, videos in video/Pics in pic) with cool animation and shape. For example, we can easy to merge the facecam video with the gaming video, etc. No lag and high quality. Set the mood for your movie by giving it a soundtrack. It’s easy to add songs, mood music, and any other audio. Or use your own words and voice to describe the scenes in your movie. Voice-over is effective and simple to add. Built-in the best lyric video maker, easy to make the best 2D and 3D lyric videos with cool animations and special effects, you will be the next popular singer on the world. Have you imagine letting videos, pictures and texts moving? That’s so cool, now easy to add motion effects onto the videos, pictures, texts, lyrics, subtitles, etc. easy to make cool animation movies for Youtube. Want to share your face, body, beauty, sexuality, mood, etc? Now that’s easy, easy to record/capture videos from cameras or capture card, then share on youtube, let more people remember you. Want to share your gameplay, operation tutorial, product demo, etc? Now that’s easy, easy to record computer screen videos, high efficiency and lossless quality, then share on youtube, help viewers to follow you. Want to share your voice, songs, narration, speech, etc? Now that’s easy, easy to capture record audios from any audio device or audio input pin, then share on youtube, tell everybody what you want to say. Want to Speed up or down the video? so easy, now you can customize the video and audio playback speed directly, easy to make fast motion or slow motion effect on your video. Uploaded videos looks bad, fuzzy, distortion, etc, feel confused, now, with the predefined profiles, you can easy to make the best youtube videos, supports HD Youtube Videos. Upload a batch of videos to youtube, Sounds simple, but in fact, we encountered a lot of troubles, wait for a long time, format errors, length limit, size limit, etc, still confused? now, everything will become really simple without troubles, just simple. Built-in powerful video/audio editor, with it you can easy to edit any formats videos and audios, such as cut, trim, split, merge, rotate, crop, resize, zoom in/out, adjust volume, fade in/out, green screening video, mix mutliple videos on same screen, etc. Allows you to arrange video clips and pictures using a timeline, this will help you to add action, effects, texts, titles and background music at just the right moment easy. Just drag-and-drop Youtube movie making/editing, drag and drop to organize and edit the movie, for a newbie, still easy to use. Already have a youtube channel, and uploaded many videos, but no views, no subscribers, no likes. feel trouble? 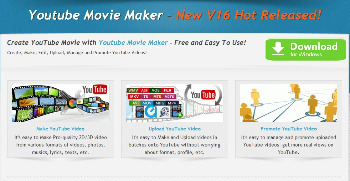 Now, use Youtube Movie Maker to promote videos, get more views on Youtube easy. Most movie maker software only supports few special video/audio formats, so we have to convert them between different formats, feel trouble? Now, use Youtube Movie Maker, it supports all popular video/audio formats. All-in-one Youtube Movie Maker, help you design, make, edit, capture, upload, publish, manage and promote youtube video fast and easy, being effective without wasting time or effort or expense. Supports 32bit and 64bit Windows, include Windows XP, Vista(32bit/64bit), Windows7(32bit/64bit), Windows8(32bit/64bit). And Hardware Acceleration is available on Intel® processors with Quick Sync Video(17X Faster). • New “Audio Shake Effect” module, helps the user easy to make wonderful music video with Rhythmic ‘Beat-shake’ effect, put popping text and screen shake/zoom effect on your video, video to bounce to the bass in the beat like the audio waves do. • Now within “The Credits Maker” module, the user can directly import the Credtis text from a text file(.txt), helps the user to make the Credtis video easier and faster. • Now within “Lyric Maker” module, the user can set the different 3D Layout effect for each Lyrics line, helps the user to make wonderful 3D lyrics video. • Now within “Lyric Maker” module, the user can start to match the lyrics text and music from any time point, helps the user easy to resume the previous working(just need to right click a lyrics line in the right lyrics list, and select “Start to re-record after this line”). • Now, within “Lyric Maker” module, the user can save the recorded lyrics as a standard lyrics file(*.lrc) or subtitle file(*.srt) directly. • Now, within “Lyric Maker” module, the user can set the bouncing ball highlighting all words. • Improve the program user interface. • Fixed bugs – fiexed all reported bugs.